AS NEPAL tries to recover from the massive destruction of the April 25 earthquake and the aftershocks, it faces two challenges. One, it has to ensure that the reconstructed buildings are earthquake-resistant. Two, it must prepare for the monsoon season, when massive landslides are likely to take place because the earthquake has destabilised the soil. After the quake, the government took about a month to decide on its strategy. But the decisions it has taken so far appear to be in the right direction. The first decision came on May 18 under which a blanket ban on the construction of new structures, including houses, was imposed till mid July. The government’s focus is on reviewing building codes and it wants them to be implemented in rural areas as well. Before this order no permission was needed for building a house in villages. Municipalities and village development committees across the country have been directed not to give permissions for new constructions till the new code is announced. The directive will also be applicable to houses for which permissions were granted before the quake but whose construction did not start. A National Reconstruction Counseling Committee has been constituted under the leadership of the prime minister to make policy decisions concerning rehabilitation and reconstruction efforts, while the National Planning Commission, a permanent national-level planning body, has prepared a reconstruction plan. As per this plan, the reconstruction process will have four phases. In the first phase, rescue and relief operations would be undertaken. The second and third phases include steps for “preliminary revival” (normalising life) and “infrastructures revival” (estimate and evaluation of impact of disaster). The fourth phase would be resettlement, reconstruction and new constructions. The government is also preparing a report on the damage the quake caused. An assessment by the finance ministry says the figure could be as high as US $10 billion. Nepal has conveyed this figure to national and international donor agencies. Economists say the losses could be equal to 25 per cent of the country’s gross domestic product. The grants, however, would be decided after the proposed national and international donor conferences are held. On May 28, the government announced that a national donor conference will be held on June 25. The objective of the conference is to get financial aid for reconstructing damaged structures and for resettling victims. Finance minister Ram Sharan Mahat will coordinate this conference. The date for the international donor conference has not been decided but it is expected to take place in July. The government is likely to provide a Post Disaster Needs Assessment report to Nepal’s development partners and the international community by June 10. The steps the government has taken so far would certainly help in minimising destruction in future earthquakes. But what can be done to prevent damage from landslides? Dry landslides have already become a regular phenomenon in the earthquake-affected districts and casualties are being reported everyday in newspapers. But the magnitude and frequency of landslides will be much more during the monsoon. Madukar Upadhya, a Nepal-based hydrology enthusiast, describes the situation as very critical. “There is not much we can do to prevent the damage before the monsoon,” he told Down To Earth. 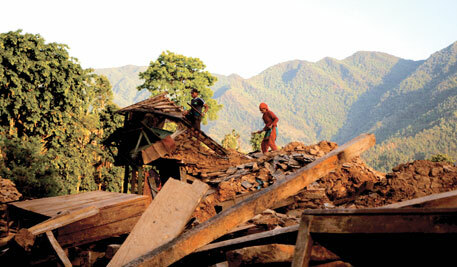 The devastation a landslide can cause became evident on May 24 at Baisari village in Myagdi district. Here, a massive artificial lake—100 m deep and 3 km wide—was created after the Kali Gandakiriver got dammed due to a landslide. The incident, which also buried 26 houses in the village, occurred because a nearby ridge had developed huge cracks and holes after the April 25 earthquake. Sixteen hours after the lake was formed, the Kali Gandaki swept away the mud and regained the flow. All 36 gates of the Gandak dam on the Indo-Nepal border have been opened after the incident to prevent damage to the dam in case of a flood. At a meeting of the National Disaster Management, Monitoring and Direction Special Committee held the same day, Deputy Prime Minister and Home Minister Bam Dev Gautam said that high alert was being maintained in the lower riparian areas. Meteorologists have warned of a high risk of flash floods and even outburst of glacial lakes during the monsoon. Director general of the department of hydrology and meteorology, Rhishiram Sharma, told reporters at Bhaktapur on May 26 that monsoon in Nepal could begin in a week and underlined the need of being prepared to manage disasters. Mild rainfall of 2 mm was witnessed in some parts on June 3. Upadhya says that mountain slopes in 29 districts have been destabilised, and in 14 of them severely, due to the earthquake. Thousands of landslides in these districts have already changed the face of the slopes since April 25. The cracks will develop further when rains come. Gole, however, is not aware of the studies the government has undertaken. The department of mines and geology has sent 18 groups to six of the worst-affected districts for studying the risks of landslides. Another analysis is being done by the International Centre for Integrated Mountain Development. This is an intergovernmental learning and knowledge-sharing body serving eight member countries—China, Afghanistan, Myanmar, Nepal, Bangladesh, Bhutan, Pakistan and India. It has gathered information about over 3,000 landslides from national and international organisations. It has also created its own database of over 250 landslides and large mass movements generated by the April 25 earthquake and its aftershocks (see ‘Dammed by landslides’). Nepal’s ministry for environment, science and technology has also announced that it will conduct an environment impact assessment to study the effects of the quake on the natural resources in the country. Experts say the start the country has made is promising. But it remains to be seen how effectively it implements its plans. 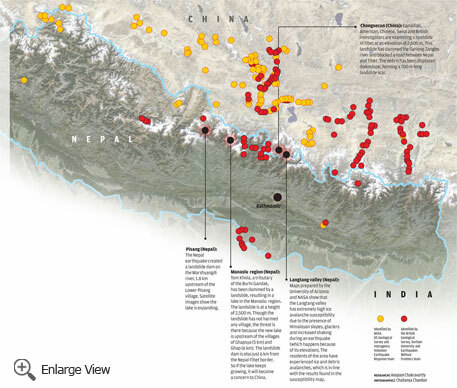 Satellite images have helped locate zones in Nepal and China where landslides can cause huge damage. The hazards these pose could be even bigger than the Nepal earthquake. They can block rivers, create avalanches and cause floods. In one such case, the Kali Gandaki was dammed by a landslide in Nepal and an artificial lake was created, forcing the government in Bihar (which lies downstream) to issue a flash flood alert on May 23.